I feel so lucky to be in this blog tour because Annemieke, the face behind Sofilantjes, is such a great girl and designer, I love how positive is she! Her designs are for garments I could easily see in my everyday life: really cute but also comfy! DISCLAIMER: This post contain affiliate links. Buying from one of those links help me grow my blog, create new free tutorials and patterns for you at NO cost for you! Thanks for your help! Exciting! For the duration of the tour the Omni Tempore Bundle is at 30% off, while child sizes and adult sizes (bought separately) are 20% off. No coupon code needed, just click on the image above! 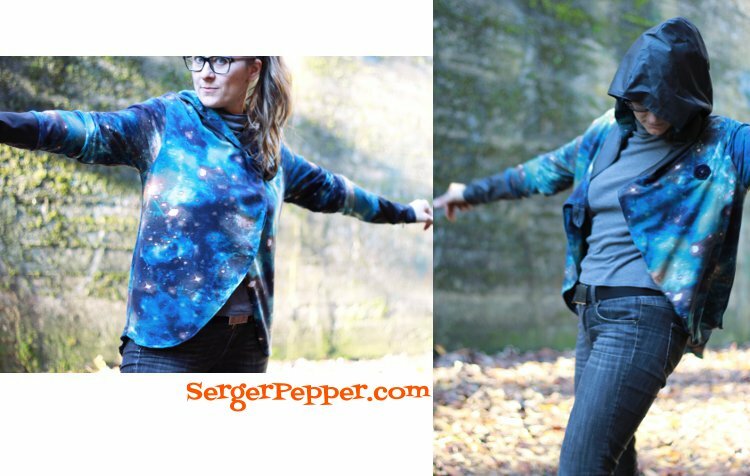 This PDF pattern is for a versatile blouse with a wide hood! The whole thing can be done in t-shirt knit, maybe going down one size, for a spring/fall long (or short) sleeved under-jacket shirt… or maybe, using a fleece or wool blend knit or even sweatshirt for that kind of top you can keep with you “just in case” you need something warm when the evenings become colder! And it comes in a wide range of sizes (child, woman and man! ), so you can create matching outfits for everyone in your family! I was in need of something like this, to be worn for the Christmas Dinner Out we always do with our swimming pool associates: something practical and comfy, but cute! I decided to slash it in front (cardigan style, a design I’m obsessed with, lately… ) and add a little length in the back (creating a fashionable hi-lo). 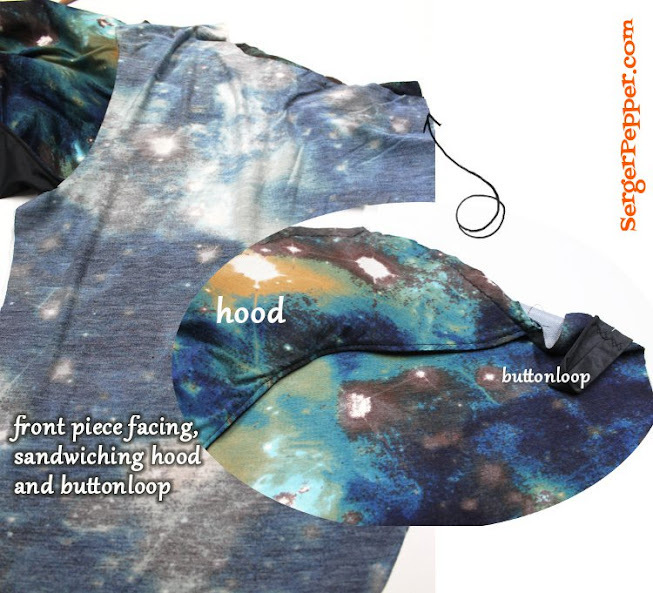 To keep the interesting design of the hoodie, overlapping in the front, I’ve decided to extend the right pieces over the center front, adding a huge decorative vintage button (and a fabric loop) on the upper layer and a little sew-on snap (still to be sewn in place) to keep in place the lower layer. I have to admit that one of my obsessions in cardigan patterns, is to find the better way to finish the inside. The perfection for me would be a totally lined cardigan, with no seams exposed but sometimes (like this time), you simply can’t line it all: the back wouldn’t be as flowy as intended! I’ve decided its placement (along the right front left edge), then secured in place with a couple of machine stitches so it was out of the way while I was lining the right front piece, without going anywhere! after adding the sleeves, I’ve closed the underarm and side seams all in once, including both front layers and serging the edges to finish that seam. to finish the portion of seam between the back piece and the hood, I’ve sewn a folded lengthwise strip of knit above it, folded down again, pressed and topstitched above the seam allowance I was trying to hide (just like if it was a sort of bias strip). If I was doing it again, I would certainly add a facing to the back part, tracing it from the back pattern piece! Last thing: I had to finish the back hem: a rounded edge of a slinky thin jersey knit… what’s better than a rolled hem? Nothing better, in my book! But let’s take a deeper look to the cuffs… I love really long sleeves (probably because I have long arms that RTW garment’s sleeves can’t properly cover), and I’m always searching for fun details to add some interest in my garments… this is absolutely one of my favorite experiments! To make zippered cuffs, let’s start measuring your wrist girth, the desired length of your cuffs and the girth of your arm, just where you want the cuff end. Round up these measurements, to add some wearing ease and 2x seam allowances: I’ve added something like 10 cm to the wrist girth and 3 cm to the arm girth, but I’d suggest you to cut down the wrist ease to 7 cm (it’s too wide, in the long run!). To cut the fabric, you need to be sure the stretch runs around your girth. Cut two rectangles following directions above, then fold (and press to crease) them in half, matching the two 27 cm wide edges. To narrow the wrist side (which goes where the fold is right now), you need to measure the wrist girth (+7 cm or + 2 3/4″) centered on that fold. Mark with chalk (or one of those amazing heat vanishing Frixion Pen*, if you’re using a color lighter than mine) and cut away the sides, starting from each bottom corners. When you open the fabric, an hourglass shape will magically appear! 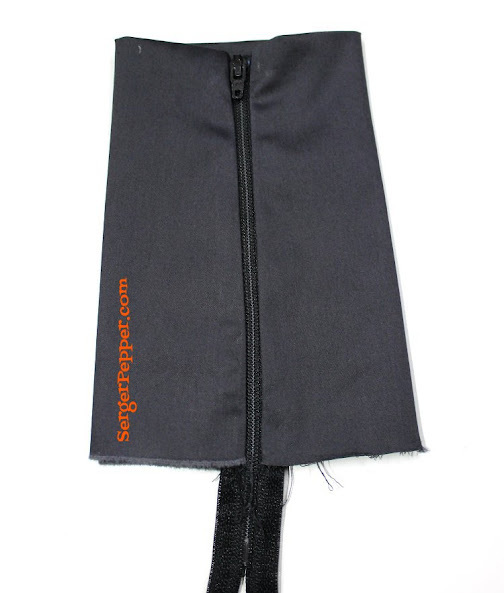 Open the zipper and lay one side of its tape above one of the seam allowances, right sides together (zipper tab down). You want the teeth to be right where the fold is. You can baste in place, if you’re not sure of the placement or if it’s your first time with zippers, or maybe you can use some Wonder Tape* (I use pins, but you need some experience to avoid lumps and bumps!). 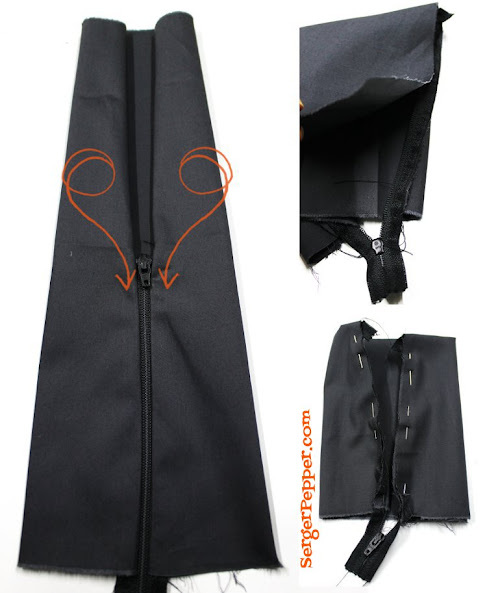 Repeat with the other side of the zipper (open the zipper to make things easier). Sew (using a zipper foot) all along the zipper, until you reach the end of the teeth, than backstitch (but DON’T sew over this point); fold the zipper tape out of the way and secure it there with a couple of stitches. Press the fabric away from the zipper. Repeat for the other side of the zipper tape (do not twist it!). Let’s go and stitch that zipper to the inside layer of cuff: fold the fabric right sides together, along the fold but in the opposite way. 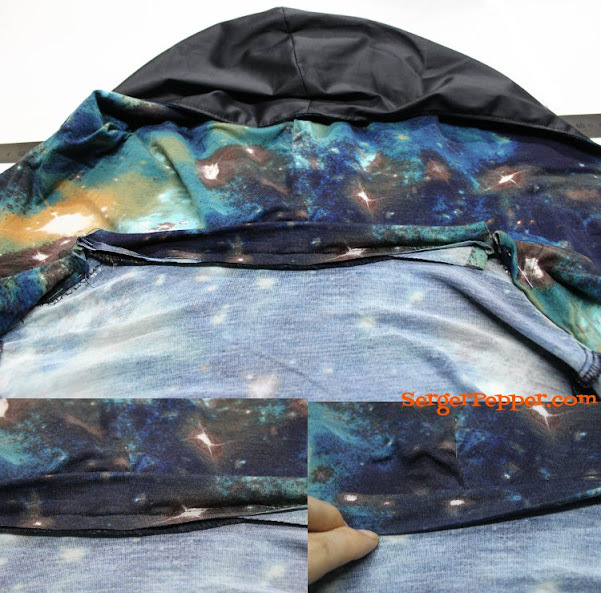 Baste, pin or use some Wonder Tape* to secure the zipper tape to the fabric, just as you’ve done with the outer layer. Sew, always using a zipper foot, trying to stay as near as you can to the zipper teeth (you can feel them above the fabric quite easily); repeat for the other side. Turn inside out and press, I’ve found it really easy, using my handmade sausage roll! Note that I didn’t cut any length from the original sleeves (but, as I’ve said, I love REALLY long sleeves): try on your shirt and decide if you need to make sleeves shorter! Turn inside out the garment and insert the cuff on it with your zipper… zipped, right sides together, and matching the zipper to the underarm seam. Sew together using a triple straight stitch. When you sew above the zipper teeth, be careful and go slowly to avoid a bent needle! I’ve added a row of stitches above the zipper teeth inside the seam allowances (that I’ve then serged), just to be sure it won’t get undone! 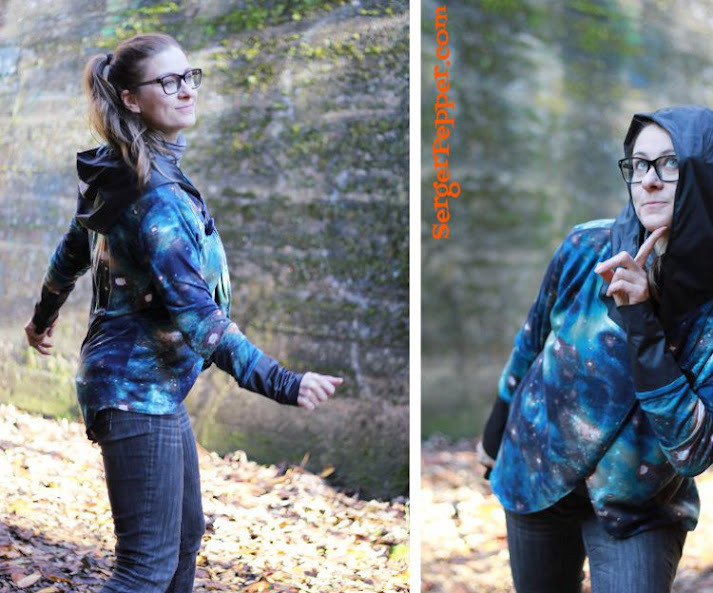 I hope you enjoyed this little variation to the Omni Tempore PDF Sewing Pattern designed by Sofilantjes! Get your copy today: during the tour the Omni Tempore Bundle is at 30% off (child sizes and adult sizes bought separately are 20% off), only at Sofilantjes.com no coupon code needed! Don’t forget to take a look to all the other blog tour participants and to entry the giveaway!